How to Play Blackjack in Las Vegas? Blackjack is a card game also known as "21" as the object of the game is for a Guest to get their card total as close to the total of 21 as possible without going over, or "busting". The Guest is initially dealt two cards and plays against the total of the Dealer's two cards. The Guest has the options to hit, stand, split, or double on certain hands trying to "beat" the Dealer's hand. Las Vegas casinos offers many different styles of the game of Blackjack with different amounts of decks used, different rules and varying options. 1. Insurance is available on all Blackjack games. 2. Guests may wager on three hands maximum on six and eight deck shoe games and two hands maximum on single or double deck games. 3. Guests may Double Down on any first two cards, including Blackjack, for an amount up to the initial wager; under the condition that only one additional card will be dealt to the hand. The Double Down wager may be placed on either the right or left of the initial wager. If the additional wager is for less than the initial wager, the Dealer will announce, "Doubling for Less" and the new wager will be placed on the (Dealer's) right side of the initial wager. 4. Guests may Split any two identical cards or cards of equal value into two separate hands. All face cards and 10s have a ten value. The number of times Aces may be split varies on different games. The Split wager must be equal to the initial wager. The Dealer will ensure that the wagers are placed apart and not right next to each other. Double down is allowed after all splits, except Aces. 5. Only One burn card will be used at the beginning of a shoe or deck in play on all Blackjack games. Dealers will NOT burn a card during a Dealer exchange. If a Guest requests to see the burn card, a Pit Supervisor will be notified and present to expose the card. 6. "Grandfathering" rule will be in effect at all times. 7. All decks or shoes will be broken down and spread into two face down semicircles across the work area of the layout on dead games. 8. The "Hole" card will be turned over using the top card corner to lift over the "Hole" card from the side of the card. A "painting" move will not be used. 9. The Dealer will offer the cut to a Guest at the table starting with seat 1 and rotating the cut clockwise around the table. If the Guests ask for the Dealer to cut, the Dealer must announce "Dealer Cut" and wait for approval from a Pit Supervisor. A Dealer cut will be in the middle of the decks. a. The Dealer will pick up Guest's busted (the total of the cards is over 21) hands and the losing wager immediately in the sequence it occurs. b. The Dealer's hand will be picked up first. c. The Dealer will pick up the Guest's remaining cards in order from the right moving counterclockwise, to the left of the layout. d. All cards will be picked up with the right hand and placed into the discard rack face down. The cards will be picked up in order, making sure the Dealer's hand is on the bottom of all cards (top of the discard rack) picked up. e. The Dealer will not back up any cards for any reason after they have been placed into the discard rack. If a Guest questions a hand in play, the Pit Supervisor will remove the top cards from the discard rack which will be the Dealer's hand. Cards will be removed in order from the first hand on the right, moving counterclockwise until the hand in question is reached. The Pit Supervisor will make a final decision on the hand. 12. 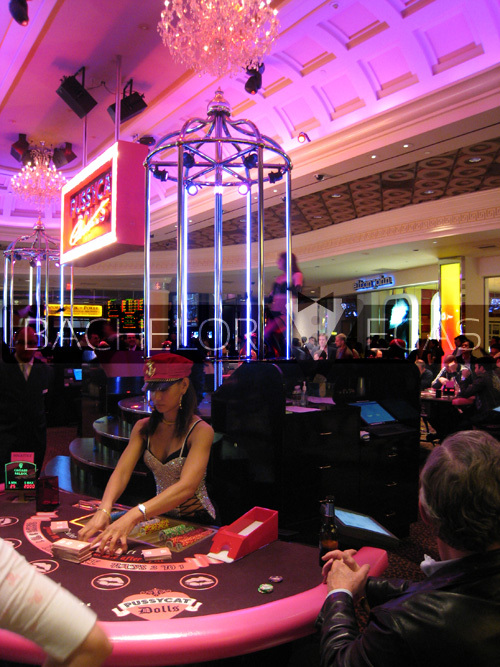 The work area of a Blackjack game is defined as the area in front of the Dealer between the Insurance line printed on the layout and the rack. a. If the wager was not verified before a hand was dealt and wins, the Dealer will verify the wager in the betting circle. The Dealer will pay only up to the posted table maximum or a Guest's authorized wagering maximum. Any amount that is over the maximum will be returned back to the Guest outside of the betting circle. b. If the wager was not verified before a hand was dealt and does not win or busts before the end of the hand, the Dealer will remove the wager from the betting circle and bring it to the work area. The Dealer will prove the wager for the Guest and Pit Supervisor. Any amount that is over the maximum will be returned back to the Guest outside of the betting circle and the losing wager will be placed into the rack. a. On a game that Hits soft 17, the Dealer will Stand on any hand that is a "hard" 17 or higher and Hit if the total is soft 17 or less. b. On a game that Stands on all 17s, the Dealer will Stand on any hand that is a 17 or higher and Hit if the total is less than 17. Blackjack is an Ace and any ten value card as the first two original cards dealt. Blackjacks are paid at odds of 3 to 2 on Two, Six, or Eight deck Blackjack games. Blackjacks are paid at odds of 6 to 5 on Single deck Blackjack games. 1. Dealers will not convert, bridge, or cap any Blackjack payments. 2. The Dealer will break down a Blackjack payment in the work area, stack it up, and heel it next to the Guest's original wager. The Dealer may also size into the payoff of the original wager with the remaining half next to it. 3. If a Guest's Blackjack wager is of 6 or more cheques of the same color, in an even amount, the Dealer may cut the stack in half and size into it three times. If the wager has an odd cheque after breaking the stacks in half, the Dealer will bring the entire amount of payment out of the rack at once, size into the two halves three times, and pay the odd cheque separately in front of the stacks of cheques. 4. Blackjacks will be paid in sequence of occurrence that the Dealer addresses the hand after checking for a Dealer Blackjack in the Tech Card Reader. The cards will be placed in the discard rack immediately after payment. 5. 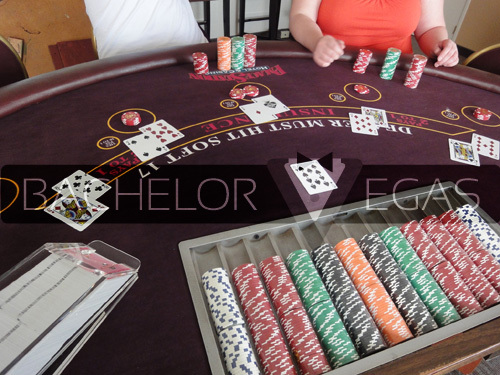 A Guest will be allowed to Hit or Double Down on a Blackjack. The Dealer will ask for a Stand hand signal on any Blackjack. 6. The Dealer will offer Insurance when the Dealer's face up card is an Ace. Guests have the option to place a "Bet the Set" side wager on Six or Eight Deck shoes and on Double Deck. Bet the Set offers a Pair Square and the minimum wager is $1 and the maximum wager is $100. A "Set" or "Pair" is if the Guest's first two cards dealt are a "Pair" or two cards of the same rank value. Example: A seven and a seven are a pair. A ten and a ten are a pair. A ten and a Queen are NOT a pair. Six Deck Blackjack will be dealt with six standard 52 card decks out of a standard shoe and will be shuffled by hand or by an MD-2 shuffle machine. Eight Deck Blackjack will be dealt with eight standard 52 card decks out of a standard shoe and will be shuffled by an MD-2 shuffle machine. All cards will be dealt face up out of a standard shoe and the Guests may not touch the cards. 1. A Guest may wager up to three hands at the table minimum. (When wagering on multiple spots, the wagers must be adjacent to each other). 2. The Dealer will stand on all 17s in High Limit. 3. The Dealer will hit soft 17 in the regular gaming areas. Dealers and Pit Supervisors are responsible for knowing and following the "soft 17" rule as it is stated and printed on the layout, on each individual table. Special management approved circumstances may allow a Guest to play with a different rule than printed on the layout, and a sign will be placed on the table to signify any rule changes. 4. Guests will be allowed to Surrender after receiving their first two cards. 5. Guests will be allowed to double down on any two cards, including a Blackjack. 6. Guests will be allowed to re-split Aces up to three times for a total for four hands. 7. Guests will be allowed to double down after splitting. If the Dealer's face up card is an Ace, "Insurance" will be offered. Insurance is an additional wager made by a Guest to "Insure" against losing their initial wager in the event the Dealer's hand is a Blackjack. A Guest may wager up to half of their initial wager. A winning Insurance wager will be paid odds of 2 to 1.
a. Announce "Insurance Open" as they sweep their right hand PALM UP from left to right over the Insurance line on the layout. b. Give the Guests enough time to make an Insurance wager. c. Announce "Insurance Closed" as they sweep their right hand PALM DOWN from right to left over the Insurance line on the layout. 2. The Dealer will not offer an even money payoff. However, if Guest requests even money on a Blackjack, the Dealer will announce, "Even Money", wait for a Pit Supervisor's approval, pay the wager even money 1 to 1, and place the cards into the discard rack. 3. The Dealer will make change for a Guest who does not have exact change to place an Insurance wager. If a Guest is playing two hands of the same amount and wishes to insure both hands, the Dealer may place the exact amount of the two hands insured together on the Insurance line between the two hands, with Pit Supervisor approval. 4. If the Dealer turns over a Blackjack, all original wagers will lose, except a Guest's Blackjack, which will Push. All Insurance wagers will be paid individually on the insurance line at odds of 2 to 1. 5. If the Dealer does not have Blackjack, all Insurance wagers will be collected from right to left and the round of play will continue. 1. The Dealer will place the Double Down card face up and perpendicular to the first two original cards, making sure all center pips are visible. If a Guest requests the Double Down card face down, the Dealer will announce "Double Down Face Down", and does not need approval to place the card face down and perpendicular to the original cards. The Dealer will not allow the Guest to touch the card. 2. If a Guest Doubles Down on 4/4 or 5/5, the Dealer will verbally verify if the Guest wishes to Double or Split. 3. If a Guest Doubles Down on a hand point total of twelve or more, the Dealer will announce, "Doubling Down on a Hard Twelve (or any other total of more than 12)" and the Double card must be placed face up. 4. During the "Pay and Take" sequence, the Dealer will expose the Double Down card and place it horizontally across the first two cards ensuring that all of the card's center pips are clearly visible. 5. When paying a Double Down wager, the Dealer will not stack the wagers together. The Dealer will pay a winning wager by sizing into the original wager twice. If the Double Down wager is for less than the original, each stack will be paid separately. 1. Cards of equal value may be Split up to three times making four separate hands. 2. Any Guest splitting Aces will only be dealt one additional card to each Ace. 3. The Dealer will deal a second card to the first Split and the Guest will make a decision to Hit, Stand, Split again, or Double Down. The Guest will be required to make a hand signal to complete the first hand before moving to the second Split hand. A Guest may Split a third and fourth time if the card is of equal value to the first card. 4. A Guest must receive at least one additional card to each card Split. 5. If a hand busts and goes over the total of 21, the wager and the cards will be removed immediately. 6. Guests may Double Down for up to the amount of the initial wager on a Split hand, with the exception of Aces. 7. The Dealer will pay or take Split hands separately. If one Split wins and one Split loses, the Dealer may lightly pat the table to indicate a Push and will point out to the Guest that one hand pays the other. Guests will be allowed to "Surrender" or give up half of their original wager after they have received their first two cards. 1. If the Dealer has a Blackjack, the hand is over and the Guest will not be allowed to Surrender. 2. A Guest who wishes to Surrender will not use a hand signal to Hit or Stand. The Guest will verbally announce, "Surrender" to the Dealer. The Dealer will verify the Guest's wishes by announcing, "Surrender" out loud. Double Deck Blackjack is dealt with two standard 52 card decks. Las Vegas casinos offers two different styles of Double Deck. In High Limit, the cards will be hand held by the Dealers, dealt face down and "pitched" to the Guests who may touch the cards. In the regular gaming areas, the cards will be dealt face up and the Guests will not be allowed to touch the cards. 1. Dealers will hit soft 17 on Face Up Double Deck games. 2. Dealers will stand on all 17s on Face Down "Pitch" Double Deck games. 3. Guests may not surrender. 4. Guests may only split Aces once receiving one card on each Ace. 5. Guests may double down on any two cards, including a Blackjack. 6. Guests may split any two equal value cards. Guests may double after splitting, except on Aces. 7. No Mid-Deck entry is allowed. A Guest may NOT sit out one hand and come back in, until the next shuffle. 8. Guests may play one or two hands only. If a Guest plays at the beginning of a deck, they may switch from one to two hands or two to one hand during a round of play and this is not considered mid-deck entry. Single Deck Blackjack is dealt with one standard 52 card deck. The cards will be dealt face up and the Guests will not be allowed to touch the cards. Single Deck rules differ from other Blackjack games and Dealers are responsible for knowing, following, and enforcing the rules when dealing each different Blackjack game. 1. Blackjacks pay odds of 6 to 5. 2. Guests may not take even money on Blackjack. The Guest will be required to place an Insurance wager for up to half of the original wager. 3. Dealers will hit soft 17. 4. Guests may NOT surrender. 5. Guests may only split Aces once receiving one card on each Ace. 6. Guests may double down on any two cards, including a Blackjack. 7. Guests may split any two equal value cards. Guests may double after splitting, except on Aces. 8. Guests may play one or two hands only. If a Guest plays at the beginning of a deck, they may switch from one to two hands or two to one hand during a round of allowed. A Guest may NOT sit out one hand and come back in until the next shuffle.play and this is not considered mid-deck entry. 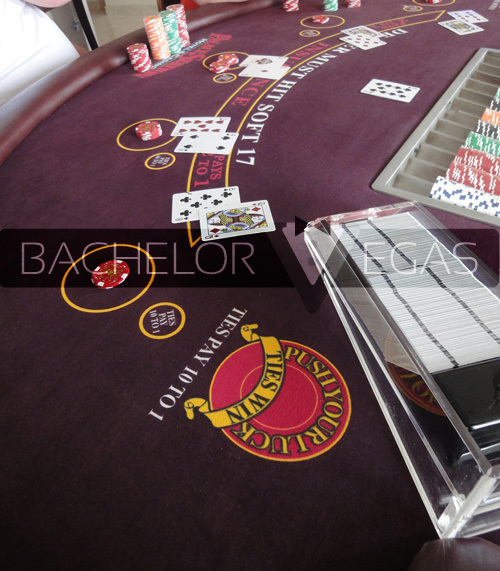 Blackjack Switch is a variation of Blackjack in which each Guest plays two hands of Blackjack per round of play. The Guest makes two wagers of equal value on two separate hands of Blackjack and has the option to switch the second of the two cards dealt per hand. An optional bonus "Super Match" wager may be placed that is based on the values of the first four cards of the two separate hands. After seeing the two starting hands, Guests will decide whether to "switch" the second card or not. The hands are played like a regular Blackjack game after a switch decision is made. In the game of Blackjack Switch, Blackjacks are paid even money and the Dealer's total of 22 results in a Push of all remaining hands in play. 1. Blackjack Switch has five individual gaming spots (ten total wagering areas) for Guests. Each spot allows for two separate wagers and Blackjack hands. 2. A Guest may only play one spot (two hands) per round of play. A Guest must place two wagers of even amounts in the two wagering areas for two hands, per one round of play. 4. After Guests have placed equal amounts on the two wagering areas, the Dealer will begin dealing the cards one at a time, beginning on the left side of the layout. 5. Dealers will scan the layout and make sure each Guest has placed two wagers each and that they are of equal amounts before dealing the first card. 6. The Dealer will move from left to right delivering one card face up to each wagering area. One card will be dealt face down in the work area in front of the Dealer. 7. The Dealer will start at the left and deliver a second card face up to each wagering area. The last card will be dealt face up on top of the Dealer's first card. 8. Each Guest should have four cards total consisting of two cards for each of the two hands. The Dealer will have two cards. 9. Blackjacks pay even money only and the cards will be removed and placed into the discard rack immediately after payment. 10. The Dealer will hit a soft 17. 11. If the Dealer's hand total is 22, all remaining Guests in a round of play will Push. 12. No Surrender will be allowed. Guests may only have the option to "Switch" if the Dealer does not have Blackjack. The "Switch" can only be performed on the second cards (the top card closest to the Dealer) received between both of the Guest's hands. 1. All switches will be performed by the Dealer and the Guests will NOT touch the cards. 2. A hand signal of a twisting hand motion will be used by the Guest to signify the request to "switch" their second two cards. If a Guest "switches" and wishes to "switch" back, this will be permitted provided that no other hands have been acted upon. 3. If a Guest "switches" or not, any further play regarding standing, hitting, splitting, and doubling will follow regular Blackjack rules and procedures (with the exception of "Blackjack" paying 1 to 1).  Guests may re-split Aces up to three times for a total of four Aces. Only one card will be received per Ace and place perpendicular to the original cards, without covering the center pip on the card. 4. After the Dealer has completed action on both of one Guest's hands, the Dealer will move to the right to the next Guest's hands, starting with the option to "switch" their cards or not. 5. When the Dealer has acted on all the Guest's hands, the Dealer will play out the Dealer hand in the same manner as regular Blackjack. If the Dealer's total equals Exactly 22, the Dealer will slightly tap on the center of the layout to signify a Push of all hands. Note: If the cards are "switched" into a hand total of 21, this is NOT a Blackjack. The Dealer will place the card perpendicular to the original card to signify the hand was switched into 21 and not a Blackjack.